MILLS, Wilbur Daigh, a Representative from Arkansas; born in Kensett, White County, Ark., May 24, 1909; attended the public schools; Hendrix College, Conway, Ark., and the law department of Harvard University; was admitted to the bar in 1933 and commenced practice in Searcy, Ark. ; served as county and probate judge of White County, Ark., 1934-1938; elected as a Democrat to the Seventy-sixth and to the eighteen succeeding Congresses (January 3, 1939-January 3, 1977); chairman, Committee on Ways and Means (Eighty-fifth through Ninety-third Congresses), Joint Committee on Internal Revenue Taxation (Eighty-sixth through Ninety-third Congresses); was not a candidate for reelection in 1976 to the Ninety-fifth Congress; tax consultant for the Washington office of Shea, Gould, Climenko & Casey, a New York law firm; was a resident of Kensett, Ark., until his death in Searcy, Ark., on May 2, 1992; interment in Kensett Cemetery, Kensett, White County, Ark. Papers: 4 letters (1970-1974) in the Bella S. Abzug collection. Official correspondence. Finding aid in repository. Papers: 1 letter (February 18, 1958) in the Council on Religion and International Affairs papers. Official correspondence. Finding aid in repository. Papers: 1 letter (March 11, 1971) in the Whitney M. Young collection. Official correspondence. Finding aid in repository. Papers: 1939-1977. 300 cubic feet. Congressional, business, and personal papers and correspondence, photographs, and memorabilia. Closed for processing. Oral History: November 2, 1971. 52 pages. Manley, John F. "Wilbur D. Mills; A Study in Congressional Influence." American Political Science Review 63 (June 1969): 442-64. Ralph Nader Congress Project. 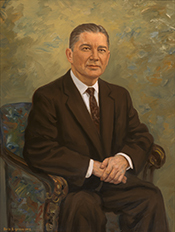 Citizens Looking at Congress: Wilbur D. Mills, Democratic Representative from Arkansas. Washington, D. C.: Grossman Publishers, 1972. Zelizer, Julian E. Taxing America: Wilbur D. Mills, Congress, and the State, 1745-1975. New York: Cambridge University Press, 1998.